National Football League (NFL) head coach Mike Tomlin was born on March 15, 1972 in Hampton, Virginia to Julia and Ed Tomlin. Mike Tomlin’s birth father was not an extremely prominent figure in his life due to his divorce with his mom at a young age, so he and his older brother Eddie were mostly raised by his biological mother Julia and his stepfather Leslie Copeland, who worked for the U.S. postal service for over 37 years. Tomlin graduated from Denbigh High School in Newport News, Virginia in 1990 and received an athletic scholarship to play football at the College of William and Mary. While there Tomlin joined the Kappa Alpha Psi Fraternity and played as a wide receiver on the varsity football team. After graduating from college with a sociology degree, Tomlin began his coaching career when was hired by the Virginia Military Institute (VMI) as a wide receiver coach in 1995. He then went to the University of Memphis in Tennessee in 1996 where he worked with defensive backs and special teams. The next year Tomlin was hired by ArkansasState University in 1997 to coach its defensive backs. Tomlin only worked there for two seasons before accepting a similar coaching position at the University of Cincinnati in Ohio. In 2002 Tomlin got his first NFL coaching opportunity when he was hired by the Tampa Bay Buccaneers in Florida as a defensive backs coach. During Tomlin’s tenure at Tampa Bay (2002-2005) his defense was never ranked below sixth overall and led the NFL in total defense (fewest yards allowed per game). The Buccaneers won Super Bowl XVIII in 2003, and Tomlin’s defensive backs earned a Super Bowl record five interceptions, three of which were returned for touchdowns. After his successful tenure at Tampa Bay, Tomlin was hired as the Defensive Coordinator for the Minnesota Vikings in 2006. When he was hired, two of the Vikings players were older than Tomlin, and one was his teammate in college. Tomlin was named the Pittsburgh (Pennsylvania) Steelers 16th head coach on January 27, 2007. 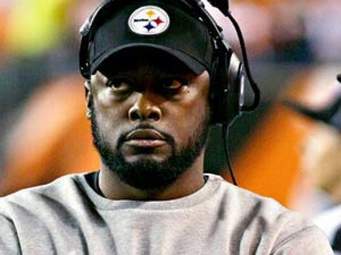 Tomlin is the tenth black head coach in NFL history but the first for the Steelers. Since joining the team he has never had a losing season and his winning percentage is a franchise best at .649 (124-67). Under his leadership, the Steelers have won two AFC Championships and one Super Bowl. During the 2008 Super Bowl Tomlin became only the third black coach to appear there and the youngest head coach to win it. Although Tomlin has an amazing record his career has had controversy. On a prime-time Thanksgiving Day game in 2013, Tomlin was seen trying to trip Baltimore (Maryland) Ravens kick returner Jacoby Jones during his return and was slapped with an $100,000 fine, the third biggest fine for a head coach in NFL history. Tomlin married Kiya Winston while attending college. They now have three sons, Michael dean (born 2000), Mason (born 2002), and Harlyn (born 2006). Tomlin lives in the affluent Squirrel Hills neighborhood in Pittsburgh with his family and is a member of the Christian and Missionary Alliance Temple there.